Dress shirts can be paired with all kinds of clothes and can be used to anchor or enhance your outfit, especially when you choose something like the Marquis Signature Slim Fit Dress Shirt. With the Marquis Signature Slim Fit Dress Shirt, you can look like a million bucks for less than 30 and we’re going to be examining why it deserves a place in your wardrobe in this article. Marquis Signature may not be the best-known brand in the world, but their mens slim fit dress shirts boast all the features of designer dress shirts but without the high price. Available in multiple sizes and colors, it can be paired with virtually anything in your closet to make you stand out for all the right reasons. Because this stylish shirt is available for under $30, it's a great choice if you’re searching for a quality dress shirt but aren’t in a position to spend a lot of money. A low-maintenance shirt, it does not require ironing after every wash, so it should be high on your list if your busy schedule doesn’t leave you with a lot of time for household chores. Furthermore, the many sizes in which the Marquis Signature Slim Fit Dress Shirt is available makes it a great choice for fashion lovers who struggle to find men’s clothes to match their body type. It should be noted, however, that this shirt features a cotton and polyester composition, the latter of which may irritate your skin, so you might want to go with a different manufacturer if you have an existing skin condition. When you buy an expensive shirt from a well-known brand, you sometimes receive a free belt or necktie to further your styling possibilities. This is generally done as a means of justifying the high price of the garment, which is why less expensive dress shirts don’t offer the same accessories. 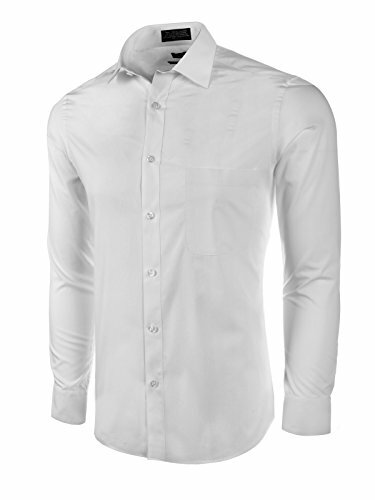 Because of its low price, the Marquis Signature Slim Fit Dress Shirt does not come with any included accessories, but you’ll be more than able to afford them with the money this dress shirt will save you. 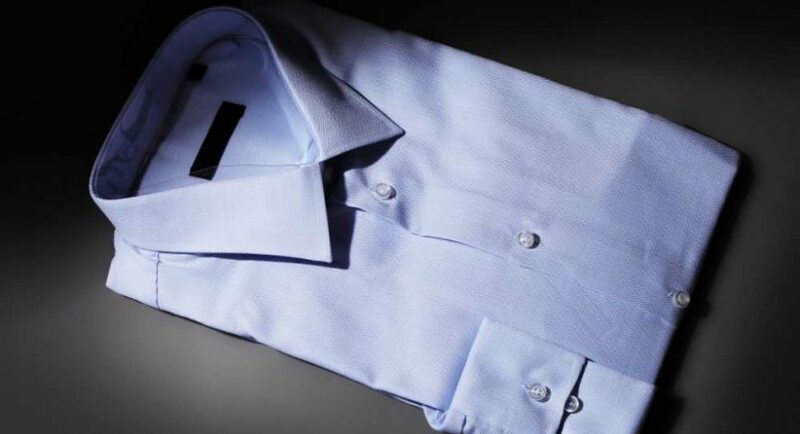 While its complete lack of included accessories may turn some potential Marquis Signature customers off the Slim Fit Dress Shirt, the garment itself boasts some pretty impressive features to make it worth your while. Among them is a point collar, which is best paired with a skinny tie but will look just as good when left bare and unbuttoned. The buttons of the shirt blend with its cotton and polyester body so as not to draw away from any color patterns you may create using this shirt and other pieces of clothing. Finally, the Marquis Signature Slim Fit Dress Shirt features a conveniently placed breast pocket which will blend in with the garment while giving you all the room you need for a pocket watch, a tissue, or a few business cards. Proper men's business casual attire can be a difficult look to define, but this dress shirt can serve as the centerpiece when putting your wardrobe together. When you need to meet a business casual dress code, we recommend pairing this shirt - ideally in a light color - with a pair of khakis and a dark blazer. You can further enhance your look with a matching belt and shoes combo (loafers are perfect here, but any smart pair of shoes will work just fine). If you’re willing to spend a little extra to get a shirt by a recognized brand, we recommend going with something like the Polo Long Sleeve Dress Shirt from Ralph Lauren. While it will set you back more than double the price of its Marquis Signature counterpart, this dress shirt is the product of one of the most popular clothing brands in the world and bears the iconic Ralph Lauren logo to prove it. Composed of 100% cotton, the Ralph Lauren Polo Long Sleeve Dress Shirt promises the perfect combination of comfort and style and should last years with the proper care. It has long been said that the clothes make the man and the Marquis Signature Slim Fit Dress Shirt will most certainly make you the sharp dressed man in any situation you find yourself in. It can be relied upon to add a hint of rebellion to a formal affair or a touch of class to a house party. While some people may take issue with Marquis Signature’s lack of popularity, individualists who purchase the brand’s Slim Fit Dress Shirt will revel in knowing the chances of somebody wearing the same outfit as them are as slim as the garment itself. Do Dress Shoes Make You Taller?